Scotland's murder rate has fallen to its lowest level for 31 years. New figures show that 79 people were the victims of homicide in the year to the end of March 2010 - a drop of 20% since last year. Figures from Scotland's chief statistician show this is also the lowest number of killings since 1979. Knives are still involved in almost half of murders but the proportion of those killed by blades has fallen significantly. 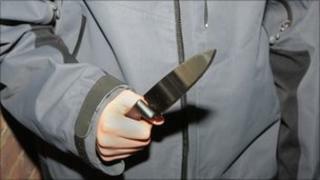 The figures show knife killings fell from 57 to 35 during the past year - a drop of 39%. More than half of all murders (55%) took place in the Strathclyde Police area. Almost 50% of all those accused of homicide were under the influence of drink or drugs at the time of the incident. Justice Secretary Kenny MacAskill said there was no room for complacency and efforts to reduce the figures further would continue. "We already know that Scotland is getting safer, with recorded crime at a 32-year low and an additional 1,000 police officers on our streets since 2007," he said. "These figures reflect that trend, but the fact Scotland's homicide rate is at its lowest for more than a generation does not give us any room for complacency. "While this significant drop means fewer families are having to come to terms with the consequences of such a terrible crime, we still have to work hard to reduce further the number of killings by tackling the booze and blades culture that still blights parts of Scotland." Labour's justice spokesman Richard Baker said: "While the overall decrease in the number of homicides is to be welcomed, there can be no complacency when stabbings continue to account for three times as many homicides as the second most common method of killing. "What is most worrying is that Labour's repeated calls for the SNP to get tough on knife crime have fallen on deaf ears." John Lamont, the Scottish Conservative justice spokesman, said: "Over 40% of all homicides are carried out by a sharp instrument, a statistic which highlights the extent of the knife crime epidemic which continues to sweep Scotland. "We also see that half of all homicides are committed by people high on drink and drugs, which is a damning indictment of a complete failure to get a grip on justice issues since devolution." Mr MacAskill said the Scottish government's "strenuous efforts" to rid Scotland of knife crime would continue, through the courts and working with young people through campaigns such as No Knives, Better Lives. "These figures also demonstrate the terrible cost of Scotland's damaging relationship with alcohol," he said. He added that he hoped this would be partly addressed through legislation ending irresponsible drinks promotions and tightening up the rules surrounding the sale of alcohol in off-licences. Can US crime 'miracle' help Glasgow?